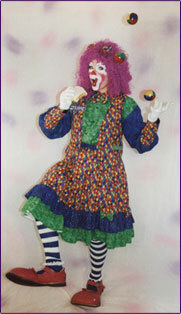 Violet the Clown, Boston’s favorite clown, has been specializing in family fun entertainment for years! Violet knows how to Wow an audience. Violet the Clown has been performing for Boston families at all of their special events. Violet mesmerizes audiences at birthday parties, corporate events, preschools, schools, libraries, holiday parties, christenings, first communions, town days and festivals. Violet also loves company parties and picnics, along with recreation department events and grand openings. Violet loves to party. Violet the Clown travels all over Massachusetts, Rhode Island, and New Hampshire delivering quality entertainment including fantastic face painting, marvelous magic and bombdiggity balloon sculptures. All of Violet the Clown’s shows are guaranteed and she has outstanding references. Hilarious family entertainment people will talk about for years to come! How do you make this years special event the best ever? Invite Violet the Clown, that’s how! Violet’s magic concert features a fun and exiting magic show tailored to your event. This high energy show is filled with tons of mind blowing magic, audience participation, zany puppetry and hilarious comedy. Violet has performed thousands of shows. She knows how to capture an audience. She will delight and amuse your guests. Violet turns an ordinary event into a “WOW! Wasn’t that awesome!” event. You’ll know you made the correct decision to include Violet as part of your event when you hear all the laughter and see all the smiling faces of your guests. Region – The Putting for Purple fundraiser held at The Green Thumb in Westborough Sept. 28 raised nearly $9,000 for Finding a Cure for Epilepsy and Seizures (FACES). Over 220 golfers and hundreds of other enjoyed the open house that also featured face painting, tattoo stations and a raffle. The event was organized by seven-year-old Emily Harmon of Southborough and her family. For more information on Emily visit http://communityadvocate.com/2014/09/25/southborough-second-grader-organizes-fundraiser-for-epilepsy-awareness/.